I never named any "favourite shows". I mentioned a few things that are not shown anymore and said that this impacted on our culture as a nation. Yes your intention from the start with your toxic behaviour was to personally attack and try and silence and shame someone who has a slightly different opinion to you. To make sure they were "gone" from the thread and hopefully the whole forum. Other people can read and make up their own mind as you continue with your little ageist digs which apparently are fine while you condemn other discrimination. I deliberately watch broadcast television in standard definition on a monochrome set. 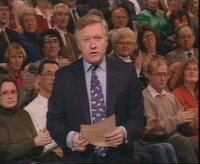 It undermines the hypnotic superficial gloss of modern TV programmes and reminds me I'm not actually seeing anything directly. I don't think colour television is evil per se, but I have heard some eccentric types do. Meanwhile It Ain't Half Hot Mum is available on Amazon et al. Keep up the bullying and sarcasm folks. Nothing like ganging up and putting the boot in is there? But don't whinge when people "selfishly" won't engage with you to return material in future because of your pompous behaviour. Blocked? Oh no!! Blocked, like a "wrong" TV show from the past! Curses!! Please don't block me!! I won't be able to... eh... I'm sure it will prevent me doing something! I mean I know some people have imaginary friends, but a gang of imaginary enemies is new to me. Edit: Okay, on second thought, it's just possible that Sue may have been joking. But still, nastier remarks have been heard. You don't have to get mad just because people don't go along with your pessimistic views and offer examples contradicting them. It's practically a confession. Sorry about the late response. No, I wasn't joking. I might have had a twinkle in my eye, but I wasn't being sarcastic, it's a 1968 Pye Pedigree I saved from landfill, and yes, I was trying to move the subject back to irritating things about modern TV. Perhaps I should explain. I was in a local computer-TV-hifi shop a few years ago, and they had this huge flat screen demo set, it must have been five foot across, showing nothing but CGI animation of endless penguins on ice floes. It was hard not to look at, but it wasn't real, it didn't even have any meaningful content. And I thought, "That's what TV is like now." Something to keep you hypnotised while you're waiting for the dentist. And this kind of visual muzak doesn't work on a 23 inch black and white screen. Any chance of a picture of your tele please Sue? Certainly! 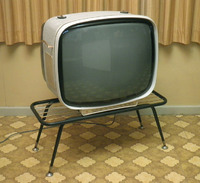 Commonly known as the "Tin Can Pye", this was the best selling TV in Australia in the Sixties; good quality electronics, cheap but stylish metal cabinet, and a low price. 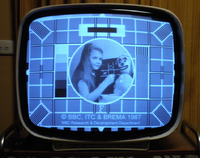 Now that analogue TV's gone, I run it via a converter on the rare occasions I bother with broadcast TV. Nice set! Thanks Sue. Glad I'm not the only monochrome fan out there. I've just had the misfortune to watch a recording of last night's Question Time and it was the usual slanging match...panelists interrupting each other and just trying to further their own views no matter what others said. David Single by just letting the rabble go on and now again trying to establish some semblance of order. No wonder this country is in such a mess when at a time when parties from the whole political spectrum should be trying to reach a consensus of opinion as Brexit is far too important to involve the usual round of point scoring. By the way it's every topic that suffers due to the childish antics of the various panels. The standard of debate is shockingly bad. 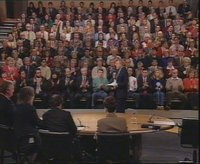 The last time I watched Question Time was when Robin Day presented it in the 80s I use to watch every Thursday night back then because at that time under Thatcher I had strong political views and found it interesting to watch nowadays to me all the parties seem the same I wouldn't trust any of them so haven't watched it since. 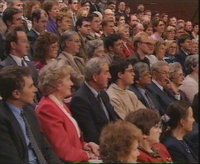 Look how smart the audience looks in 1991. I stopped watching when they started including "comedians". Recently Channel 4 News had Elton John saying what he thought about Brexit. Stick to the pop Elton! Local newspapers do this. In Manchester it's what the Gallagher brothers (Oasis) think or some thick footballer who is just like us. Yes the looking smart thing I'm afraid has affected all walks of life now including our local postmen at one time they would wear a smart royal mail uniform now it's scruffy shorts and anything goes it is a sign of the times.